I was looking forward to meeting this little guy as he was one of my first newborns since moving to Ingersoll, Ontario. I was able to photograph him when he was just 24 hours old and it’s safe to say I loved every minute of it! When I was Walking into Woodstock General Hospital, it was a little trip down memory lane for me as I delivered two of my boys there. As a Woodstock Ontario Newborn Photographer it is a privilege to be able to do fresh 48 sessions in such a lovely hospital. There is nothing quite like those first few hours with your fresh new baby and you will never regret having those images. Lincoln’s mom and dad were so laid back and I really enjoyed getting to know them. The best part is that I knew I’d be able to capture Lincoln in the studio too! Lincoln is the younger brother to three of the sweetest big sister’s ever! They just loved snuggling him and were so eager for their turn to hold their little brother and he looked so content in their arms. 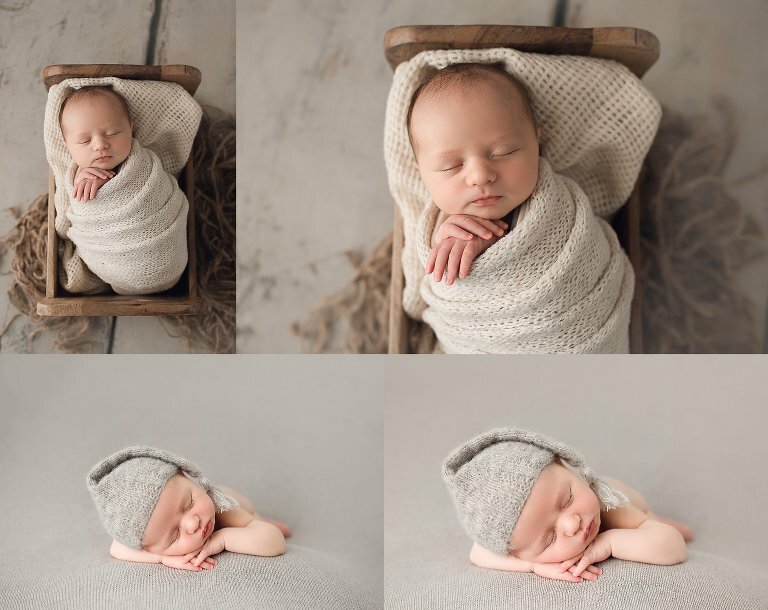 I just loved the texture of this wrap from https://naturalwhisperingwonders.bigcartel.com/ and the sleepy cap from https://baby-in-vogue.myshopify.com/. Both of these vendors are so talented and located in Canada. Lincoln was quite cozy in my little bed prop, it is always a favourite. As mostly a neutral lover, I have been branching out and using more colour in my work. I really love the results and this blue backdrop is great for boys! I am so happy to have captured this little one and can’t wait for many more in Ingersoll, Ontario.